Kanade struggles to keep Chihaya focussed on something other than Karuta. 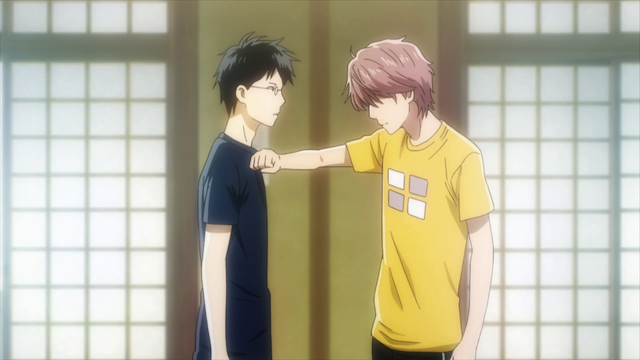 Another episode that demonstrates why Chihayafuru is the best show of 2012 so far. It made great use of the various characters it had already introduced. It showed a different side to characters we already know and love. It showed growth in certain characters, and contrasted that with the deep-set character patterns of others. It frustrated expectations, pulled the rug out from under characters, but also showed them triumphing in unexpected ways. And of course there is the ever ambiguous love triangle. The Empress gives Chihaya a talking to. Things start out with Chihaya, who is focussed exclusively on Karuta, being refused the right to participate in a tournament by the teacher she calls “the Empress”. 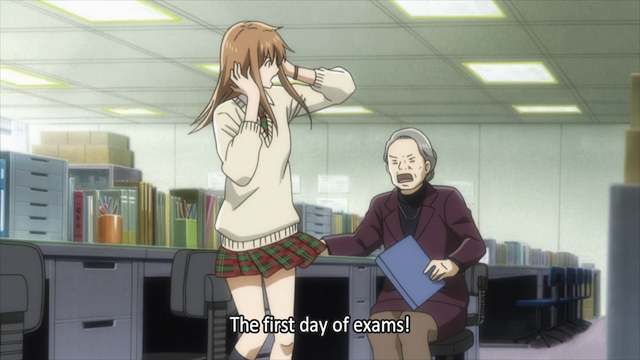 Chihaya’s scores are awful, and exams are about to begin. She is forced to sit down with Tsutomu and study academics for a change, while Taichi heads to the tournament by himself. Taichi Mashima does not look happy to be heading off to another tournament. This will be Taichi’s last chance to earn promotion to the A-Rank, which his Karuta society will only award if he wins a tournament. While Taichi fights his way through the tournament rounds, Chihaya and Nishida are receiving tutoring sessions from Tsutomu. That is until Chihaya sneaks out to cheer Taichi on. At first Chihaya’s action seems very sweet and considerate; she says she wants someone to be with Taichi so he doesn’t have to be alone when he wins or loses. However Chihaya completely forgets about Taichi’s feelings when she arrives, because Arata Wataya is playing. This leaves Taichi alone to wallow in his depression. Chihaya Ayase is awed by Arata's mad Karuta skills. 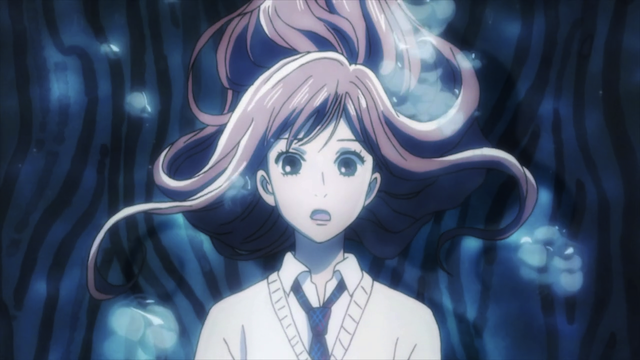 On the one hand it is understandable that Chihaya, being the Karuta nut that she is, would find the opportunity to see Arata play irresistible, but just as she seems to have grown up a little, and be showing some compassion for her team member’s feelings, she completely forgets about him. It’s the same old Chihaya. It even makes one wonder if her concern for Taichi was sincere, or if she wasn’t merely running away from her school work. Chihaya is overwhelmed because her desire to play Karuta together with her friends is no longer a seemingly impossible dream. 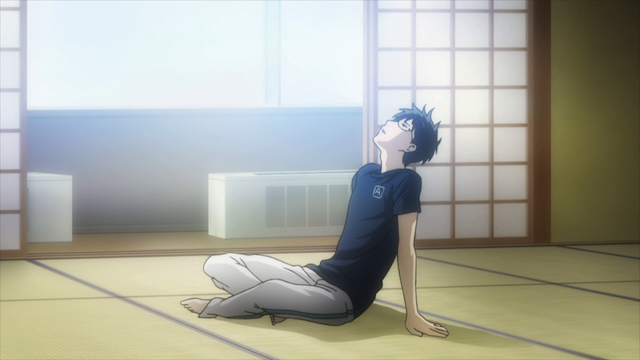 When he finally walks in to join Chihaya in watching Arata’s match, he is at first deep in his own thoughts. The “camera” tightens to a close-up on his hand clenching into a fist. 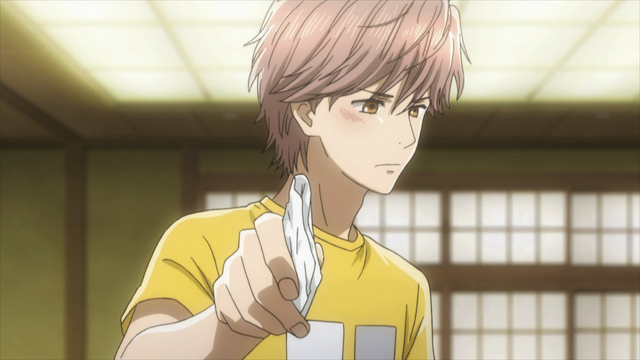 Suddenly Chihaya’s hands grab Taichi’s arm, and she is revealed to be in tears, overwhelmed because Arata is finally playing Karuta again. This scene was wonderful for several reasons. One is that it took me by surprise, because I had been expecting to see Arata play again, but Chihaya’s intense emotional reaction reminded me that this is her dream. This is the story that was set up from the first few episodes. I had gotten used to the Karuta club, so I forgot this was the opening premise, that the three of them would meet again if they kept playing Karuta. The second reason this scene really impressed me was that it reminded me of several scenes now where Taichi has tried to take Chihaya’s hand, but didn’t. Here the fake-out happens in reverse. 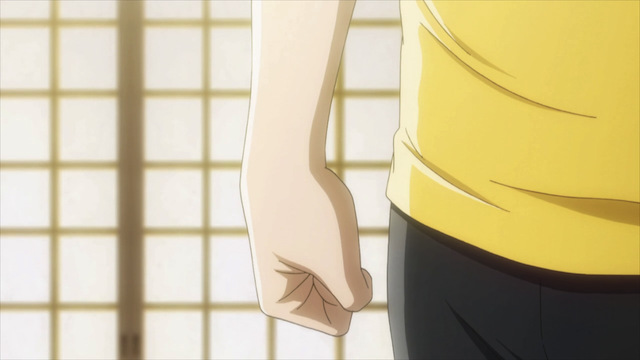 Taichi tightening his fist in frustration is suddenly interrupted by Chihaya grabbing on to him. 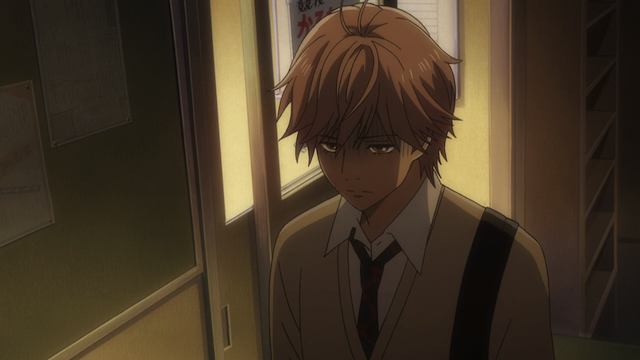 The third was the way Chihaya’s mood brought out Taichi’s own conflicted thoughts about Arata. 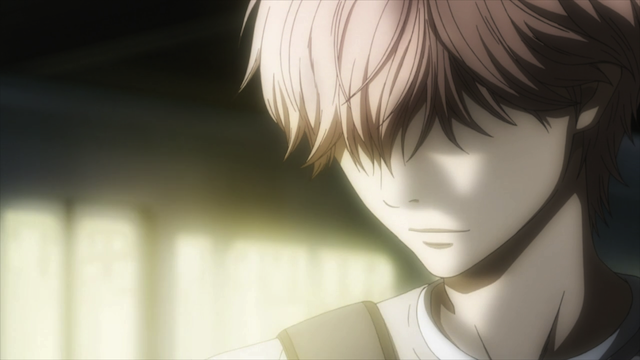 He feels intimidated by him, not quite worthy to be a rival in Karuta or for Chihaya’s heart, and yet he is an old friend that he has missed, and he is happy to see him playing Karuta again. Arata Wataya and Taichi Mashima. It would be impossible for me to go over all of the great scenes in this episode, but I do want to point out that Taichi and Arata had three great scenes together. In one, they watch the old-timers and seem to realize that one day, decades from now, they could be those old-timers who were rivals from the time they were kids. In another Taichi tries to comfort Arata who has just lost by using the very tsundere-ish, you ddn’t think you could beat our best player when you haven’t been practicing for 18 months, did you? In the third, Arata and Taichi talk about and around their complicated relationship with Chihaya, with Arata asking straight out if Taichi is going out with her. Chihaya Ayase is drawn to the tatami mats (even though she should be studying). Like the moon hidden behind the clouds. Chihaya comments that this poem is like a love poem even though it was written for a childhood friend, and says that it is perfect for Arata. Now it certainly is perfect for Arata in that she sees him only briefly each time they meet. It is also true that he is her childhood friend. Is it perfect that it sounds like a love poem? Her comments here are suggestive, but impossible to use to make anything definitive. 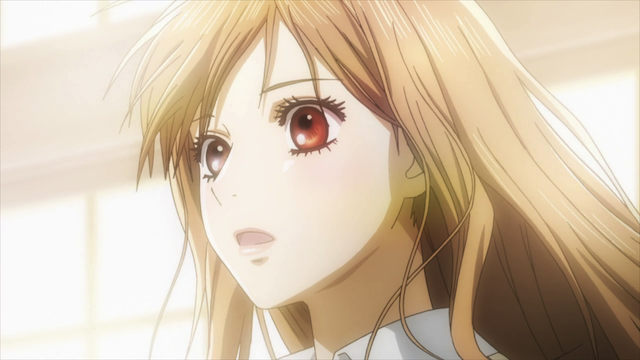 Just as she seems to care for then abandons Taichi, only to turn to him to share her joy at seeing Arata play, Chihaya’s feelings for Arata are unclear at best. For example, when she sat across from him, she was imagining Shinobu, the Queen! 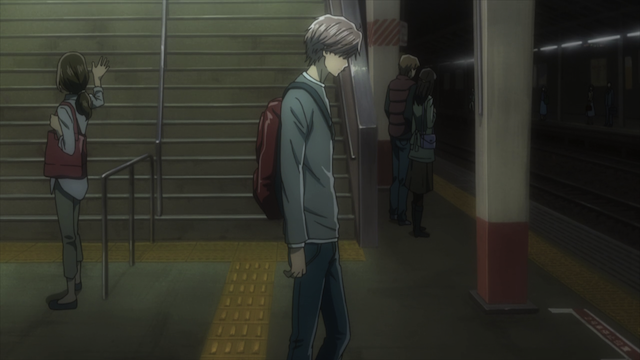 Taichi Mashima waits for a train to take him home after yet another tournament loss. It may be hard to believe but I still haven’t discussed the best scene of the episode. This is one of those times when I feel like loading up on screenshots and doing a step-by-step breakdown. I will spare my readers, however. This scene was just brilliant from the way it set up expectations, the way it used Harada-sensei’s internal monologue, and even the way it used the setting. To set this all up, you can see above that Taichi seems to be lost in thought, and the sun has gone down, so there is a heavy darkness hanging over everything. Harada-sensei is sitting on a bench out of sight in the above shot, and he thinks to himself that the human spirit can be broken if there is no reward for all of one’s hard work. He mentions to Taichi that according to the official rules (as opposed to their Karuta society’s rules) a person who came in second twice, as Taichi has done, would be eligible to advance. 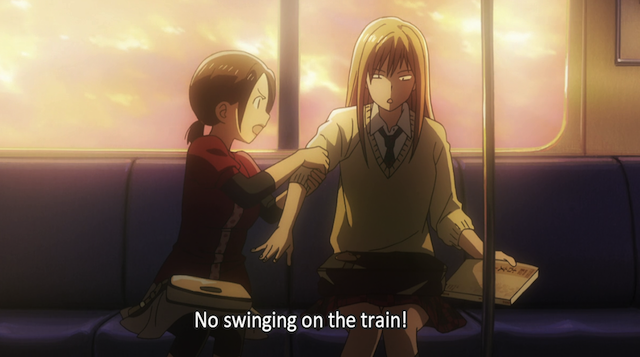 As Harada-sensei offers to promote Taichi (and thus violate the society’s rules), an announcement is heard that a train will be coming through without stopping. Taichi with train that refuses to stop in background. Taichi laughs off the offer, and, as the train hurtles by, he explains that his target isn’t to make A-rank, it is to become “someone who doesn’t run away”. This is what makes Taichi a great character. He unquestionably was a coward. He might not yet be everything that he wants to be, but he is willing to go for it, even though he knows he is fighting against his own self. He isn’t fighting against Nishida, or Arata, he is fighting against his own inadequacies. I honestly hope that, like that train, he doesn’t stop, and keeps rolling straight through to his destination. Taichi Mashima has been practicing his tsundere poses lately. Arata Wataya finally finds out what it is like to lose. 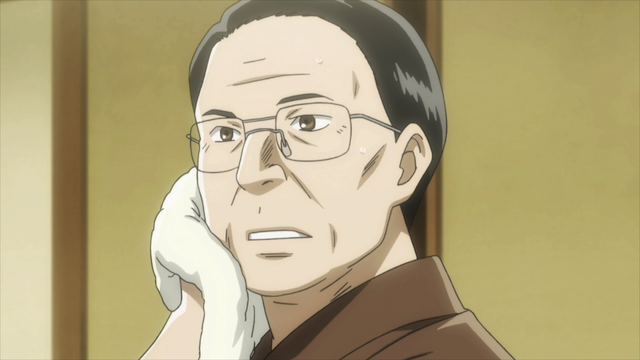 Harada-sensei -- the only man who has successfully captured Chihaya's heart. Thank you for such a detailed review. I have been waiting for this episode where somehow the real intentions of the main characters are revealed. This almost did it! The most mysterious character turns out to be Chihaya. Yeah, she’s nuts for Karuta, but the big question remains: how does she really see Taichi and Arata? I’m inclined to think her comment on the poem was a big hint: it seemed as though it was a love poem, but it really was just a poem about a childhood friend… and IT FITS PERFECTLY. Hence, Arata really is just a childhood friend to her. Whereas there is still no clue as to her feelings for Taichi, so I’m still as 50-50 about it as during the earlier eps. This episode has made it clear that although Arata has romantic feelings for Chihaya, he loves his friend Taichi just as much. Taichi is too wonderfully human in this episode. He’s not anymore all about Chihaya, or beating Arata, or ranking Class A. Although these feelings are undeniably inside his heart. Hi, I know what you mean. The characters (well except for Taichi) have been presented with so much ambiguity. I think you are probably right about Chihaya; she didn’t really come right out and say, “I just don’t think of Arata as a potential boyfriend”, though. This series is so great, I feel like each new episode is a special treat. Now that Arata is back, it seems we really are heading toward some big ending. I haven’t heard any news about a second season, but if there was ever a show that deserved it, this would be it. It’s amazing and wonderful that Chihaya is still such a mystery after all the time we’ve spent with this character so far. And that air of mystery has been maintained honestly. There’ve been no cheap tricks or blatant misdirections. Simply by (mostly) letting Chihaya keep her thoughts to herself, they’ve presented us with a delightful puzzle of a character. I just hope all the pieces fit together in a satisfying way at the end. And, I might add, she thinks about Karuta more than anything else, so when we do get to “listen in” on her thoughts, they don’t clarify what everyone is wondering about — her relationships with Arata and Taichi. Omigoodness this was such a great episode. It’s amazing how this show just keeps building up the characters: I mean, just when you thought you couldn’t love Taichi anymore. Not to mention the subtle yet important support/narration role Tsutomu played as well. I’m glad Tachi and Arata had those alone moments together, because they are both so important to who Chihaya is and how she develops as a character; whether she’s driven by Arata or supported by Taichi, she can’t live without either one of them. Their little love triangle has to be one of the most frustrating and yet intriguing parts of the show. It’s really fascinating how intricate and believable the “love” circulating between all three of them are. But I think you’re right about Chihaya: all she thinks about is Kartua, but her relating the “love-like” poem to Arata is her first step in the romantic direction. It’s typical of her that it’s only through Karuta that she can explore her feelings. This really IS the best show of 2012 so far! Yes. Chihaya actually thinking in terms of “love poem” is very unusual, and could very well be an indication of maturation on her part. They actually did something kind of cool with that poem, BTW. Chihaya was supposed to be reading Tale of the Genji, which is a novel written by Lady Murasaki, and that reminded her of a poem used in Karuta that was written by Lady Murasaki. The fact that she made the connection shows that she is learning the literature deeper than before, when all she really cared about was the sounds of the first few syllables. Now she recognizes who wrote which poem … definitely an indication that Kanade’s lectures have had an impact. I totally didn’t pick up on that. That’s very cool! But even with her musings on the poem, ambiguity remains. Was she most focused on the “love” part or the “childhood friend” part? Or both? Unfortunately, my suspicion is that, since this is an on-going story outside of the anime, the ambiguity will not be resolved by the end of the season. I have a feeling you are right. The ambiguity will remain because we only have a handful of episodes remaining. I hope the end is good anyway, because I am not confident there will be a second season — which is a damned shame. Good catch on the hand grab scene. I totally missed the meaning behind it while watching it. This episode is literally a perfect Chihayafuru episode with loads of tension and unknown progress that leaves a watcher cheering yet feeling unease. I was so conflicted for supporting who but that doesn’t matter anymore. Just seeing the trio coping and getting over their weaknesses is enough. I completely agree with you. First that this is a perfect episode. The whole episode was so full of great stuff that I wasn’t able to mention all of the things I liked about it. And also that phrase “unknown progress”; it feels like several characters moved ahead, but it is hard to know how much. And finally, setting the love triangle aside, it was nice that the main trio were finally reunited as Karuta players, and that promises good times ahead.